In accordance with ACOM’s Constitutional Canons, the General Secretary Dr Abraham Hauriasi advises that the current Archbishop George Takeli will be stepping down from office today. On 25th March 2019, Archbishop George Takeli reached the compulsory retirement age of 60. He will have served as Archbishop for nearly three years and leaves the Church in good heart. Prior to his appointment as the Primate of the Anglican Church of Melanesia, he served as Bishop of Temotu for six years and has been an ordained priest for twenty-three years, following a career in the Solomon Islands marine division. Archbishop Takeli’s term of office has seen a number of changes and initiatives. Shortly after his installation he oversaw the first Bishops’ training in the Diocese of Vanuatu and New Caledonia, highlighting the very close working relationship with the dioceses in that part of the Province. He also forged close relationships with important mission partners including the Melanesian Mission Trust Board and the Church in New Zealand, Melanesian Mission UK, and other key regional and international partners. 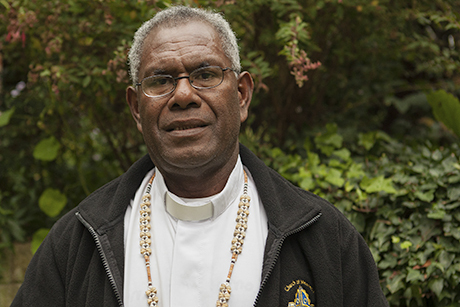 In November 2018 he presided over the 14th General Synod in Port Vila, Vanuatu and encouraged open discussions on a number of important issues, including changes to the ACOM Canons aimed at modernising the Church in line with changing social conditions, the ordination of women, and the establishment of a number of task forces. In May 2018, at St Barnabas Cathedral, he re-launched the decade of Evangelism and Renewal Programme, which is being implemented in all Dioceses within the ACOM this year. The process of selecting a new Archbishop will commence following the Archbishop’s retirement and will take place in accordance with Church Law.